Those of you who use laser attachments on your firearms may have heard of Crimson Trace. The Oregon company, now owned by Smith & Wesson is popular for their line of upper grip mounted red and green laser units, but as happens with many companies in the U.S., Crimson Trace has now been forced to recall several of its units due to an order by the FDA. Take a look at this article to see if your Crimson Trace product is included in the recall. WHAT IS THE RECALL ABOUT? On May 22, a notice was sent to dealers notifying them that Crimson Trace Red Laser products were being recalled by the FDA because of one of the vendor-supplied laser diodes exceeds the maximum allowed 5mW for this class of product, but at this point, according to Crimson Trace themselves, they have received no reports of injury from the maxed out diodes. Still though, regulations being what they are, Crimson Trace has been put in the place that they have to recall the items to ensure they follow the correct safety regulations. 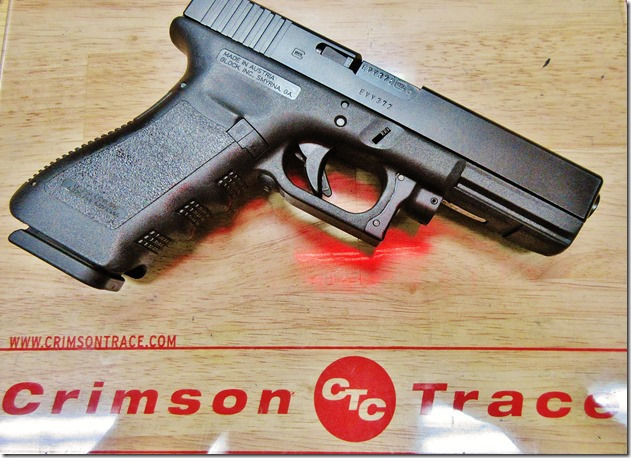 WHAT CRIMSON TRACE PRODUCTS ARE AFFECTED? Now this recall doesn't affect all Crimson Trace products that have gone out, so there's no need to worry your goods are part of the recall, but to make sure you are in the clear Crimson Trace has released a 14 page pamphlet showing you which models and serial numbers are a part of the recall, as well as how to check your serial numbers to find out if anything you have is included. You can view the full pamphlet in PDF form right here. The total number of units set for the recall is 184,390, so while a small portion of total sales, it is definitely enough to let folks know about just to be on the safe side. We hope you all are being on the safe side yourselves and making sure you figure out if your Red Laser product is involved in this recall. When inputting the serial #, include dashes but do not include spaces. It initially indicated that my laser wasn’t included on the recall when I initially included the space between LX and 380. It wasn’t until I left off the blank space and typed LX380… that it confirmed that mine is included in the recall. My S&W bodyguard 38 has a serial number that indicates it is potentially under your recall. However it will not allow me to enter the 38 on the drop down. I have a laser on my Ruger that I installed after purchasing my pistol and it’s 100% brighter and more accurate than the laser that was already on my bodyguard. I have not been satisfied with the laser usage since I purchased it last summer. I’m wondering now if this has something to do with your recall. Please let me know. My laser number on my 38 is 21CFR-1040.10. Charlene we are not Crimson Trace. You will need to contact them directly. Having problem with the crimson trace grips on my Kahr MK9 ? Not activating on all grip contacts?